Zostel Kathmandu i Kathmandu, Nepal: Bestill nå! 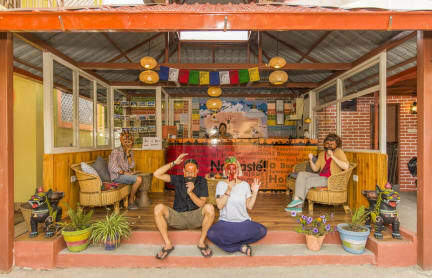 Zostel Kathmandu is the liveliest & classiest backpacker hostel in Kathmandu. Located right in the city's backpacking hub, Thamel, there is no better pitstop for travelers to explore Kathmandu on budget. Located in Thamel, Zostel captures the essence of the city. It consists of a rooftop bar, a garden cafe to soothe your hunger pangs and a huge rooftop hammock to soak in the sun making new friends. If the explorer in you is calling out, we’ll hear it well. Every day in Zostel is happening, complete with doses of laughter and experiences. Chill out with the coolest set of people from around the world and travel without hassles. Before your mischievous minds starts wandering far, let us put one thing real straight, We take the comfort of each and every traveller very seriously. Our friendly local staff will help you to plan and explore Beauty of Kathmandu.The sensory overload of sights, sounds and smells. from temples to nightlife shopping, we shall be there for everything. Stayed in several hostels in Kathmandu, this was definitely the best one. Beautiful and cozy, awesome bar and restaurant, very good rooms with your own locked drawer, only minus was the hard mattresses. I didn't get any hot showers, since they decided to turn off the hot water on occasion for some reason... The stay was amazing, super peaceful all of them. Would come back. Stayed here at two separate occations during our stay in Nepal. Nice, clean rooms. Very helpful staff. Good food at the restaurant. Would definitely book again. Best hostel I've ever stayed in. 24 hour reception, close to bars, restaurants, markets, temples, gardens, and plenty more that Kathmandu has to offer. The staff is great, both friendly and extremely helpful with everything, like ordering rafting trips or even plane tickets for you - always free of charge or commission. 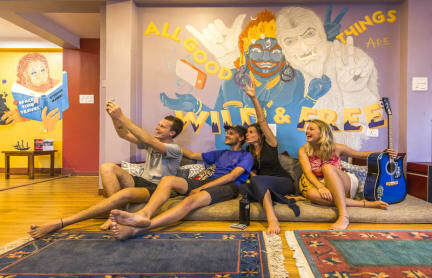 The atmosphere is perfect, you'll always find someone to hang out with in the hostel restaurant or on the terrace/roof. Very clean, brand new facilities. I'm really impressed!